When you decide to clean your car, you’ll need to start with the wheels. This is because you’ll probably spray out a lot of grime that can get onto the rest of your car. 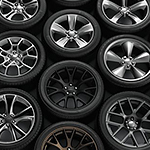 By starting with your wheels, you’ll one by one or in sets, so that you don’t allow the cleaner to dry on your tires at all. Cleaners like Pinnacle Advanced Wheel Cleaner and Wolfgang Tire and Wheel Cleaner. These are good for any type of tire, including those that are coated or anodized.